Here is how the Monorail Terminus at the start of Jungle Road is looking. Players will need to exit this enclosed area the same way they did in the original game, but once they are on the other side of the wall, they have a pretty open path to progress through the Jungle Road. The paths you can see are game trails left by the animals and have since been changed to a lighter less obvious colour. I’ve made these little trails all throughout the primary gameplay areas, to give the levels a more realistic look. From this angle shows the new road heading off up the hill, which is a bit of a short-cut to the town (later on) and is also the rear entrance to the JP3 Embryonic’s Administration buildings which are just over the hill. This rear entrance will be closed off, but players will be able to walk down and have a look, or continue walking up the road and look over the entire area, giving them a bit of a heads-up of whats to come, providing they can see anything through the trees that is. A gate will stop players from progressing towards the town, forcing players to head back and follow the path of the monorail. There will never really be a right and wrong way to go, but players will discover that some paths are more dangerous than others and although they might be able to skip past whole areas and maybe even avoid the dangerous sections, there will be important items that they will miss making progress difficult later on. As much as it would be nice to let players freely explore the island in any order they like, the reality is that complete freedom is confusing. Despite the open nature of RPG’s, you still have a mission objective that guides you and you generally have access to a map and instructions and clues form NPC’s. On an island like this where you’re alone and have no real map, and no mission objectives or information provided by NPC’s, it would just lead to confusion as the player aimlessly wandered around, trying to work out what they actually had to do. Sure it may provide hours of gameplay, but it would be hours of frustrating laborious gameplay. 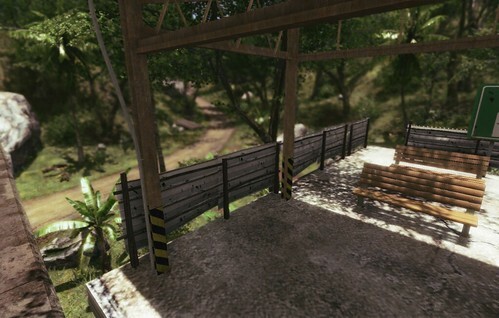 Players will get their chance to explore the whole island with no boundaries, but not until the second half of the game. I’m going to skip a head a little and lay down a thicker layer of vegetation for the rest of Jungle Road, then come back through and “fill it out” with smaller and smaller species until it looks good. 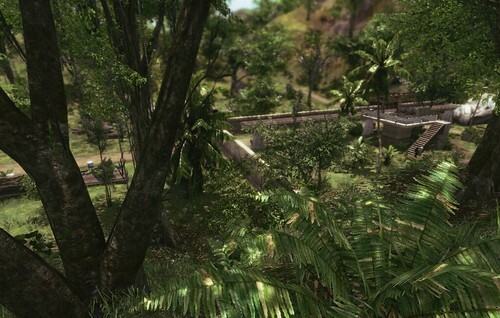 The jungle in the second half of the level will be some of the thickest in the game and will be actual jungle, with lots of tropical plants, and a very thick canopy with only a hint of sunlight shining through. Depending on how it looks and if it fits in with the geography and climate, there will also be some light lingering fog / mist over and through this jungle section. ~ by newoldmate on 13/08/2012. Hi, thanks for the comments, glad you like it! The dinosaur animation doesn’t concern me at all. No more than animation for a human character does. The tricky part will be natural and realistic behavior without it being overly scripted. The island is actually completely open, but for the first half of the game you have to follow the path of the original game. This is for a number of reasons. Firstly, its a Trespasser remake, so it allows people to play through the original game close to how it was meant to be. And second, it allows people to learn how to play the game and get to know the island and its locations. 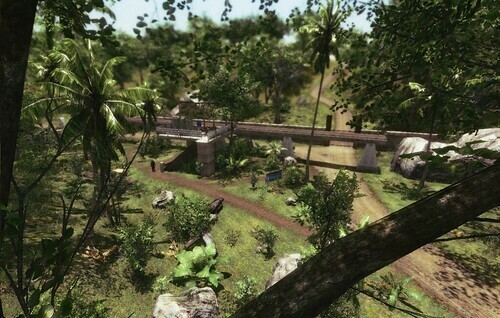 When players reach the end of the game, instead of it ending like it did in the original, they will then be able to access the computer network and start unlocking the gates and buildings that was stopping them from going anywhere they like on the island. This effectively makes the game completely open and players are free to do whatever they want in any order they like. For this second half, the task will be for players to use what they have learnt about the island in the first half, to try and plan an escape. Players will need to remember where they seen certain items and objects and use the computer system to trace the steps of the InGen workers to try and find where they may have left items, key cards, etc. This open style of gameplay means that the dinosaurs are free to wander as well, they will be driven by hunger, thirst, fatigue, territory, curiosity, anger. These factors will drive their behavior and if it can be done correctly, hopefully provide dinosaurs that look realistic because they are acting realistically. Watching a stego eat some grass in a forest, then suddenly it just wanders off and travels 500 metres to have a drink and then a nap under a tree. Stuff like that. My hope is to have an island where players can just explore and observe an “alive” environment, because i think this will create gameplay all by itself. There’s nothing more enjoyable then seeing an amazing chain of events unfold in a game, and its even better when its completely unscripted and could possibly never happen again. In a few months time ill build a test map and get started on the player movement and controls, the hand etc. Once the island is getting to around the 80% completion mark and im really desperate for some dinosaurs and custom assets, ill assemble a team and start to work on this stuff. I figure if i leave the hard work till the end, then there’s no big loss if it doesn’t all come together. I’ll still have a complete recreation of Isla Sorna which will be fun to explore even if its got no dinosaurs! Thanks again for the comments and be sure to keep your eye on the project and subscribe for email notifications of updates. Yup, I did subscribe, don’t want to miss any progress made on this project. I guess it must be the 7 years old kid in me, but when you talk about making things feel realistic I can already picture it and must refrain from jumping around with excitement. I just hope this won’t end up like all the JP projects, I’m sort of getting used to it but yours is by far the most ambitious, especially with this “2 games in 1” concept so I can’t help but being kinda nervous. Have you tried contacting some of the original Trespasser devs? Hi, i wouldn’t be too worried about this project dying, because there’s a difference between what im doing and what many other teams have tried to do. The big difference is that im working alone. This may sound harder than having a team, but you have to remember, im not relying on anyone for help. I don’t have to worry about people quitting or not having time to help. These teams are generally ran by a ‘leader’ who takes care of the project website and usually does a bit of editing themselves, but they are always relying on others. I’m not relying on any help at this stage, and because im capable of finishing the map myself, i’ll always get further than those teams. They always come out guns blazing with concept art, renders of textured and untextured models, “trailers” and of course the obligatory team logo, but all this stuff means nothing when they have no plan, just a concept of “Jurassic Park dinosaur FPS with AAA visuals”. Fair enough, my project is a remake and its not really an original concept, but it still requires planning. I have written a lot of documentation for this project, covering almost all aspects of it. There’s not much i haven’t thought about at some point. By doing things the way i am, im able to develop new elements along the way and fine tune existing features. I originally had the idea for this project when Crysis first came out. I wasn’t able to get far with it due to lack of time, skill and hardware, but i started it again seriously towards the end of last year and have been working on it solidly since. The island heightmap alone was worked on for 8 months (not solidly). That’s as long as some teams go without an update.. 🙂 As far as contacting the devs go, i’ve spoken to a few people involved in the original games development, but there’s already been many attempts to contact them in the past, so there’s not a lot more i can do. TresCom has some great interviews with the dev’s and over the years quite a bit of unreleased game content has been released and uploaded there. There is not much that isn’t known about Trespasser, just a few details regarding levels that never made it into the final game. I’d love to know what they were supposed to look like and what would be in them, but this is the nature of Trespasser and its many secrets.